What the Europa Clipper finds when it starts orbiting Jupiter’s icy moon won’t be of any use to us if it can’t send data back to Earth. 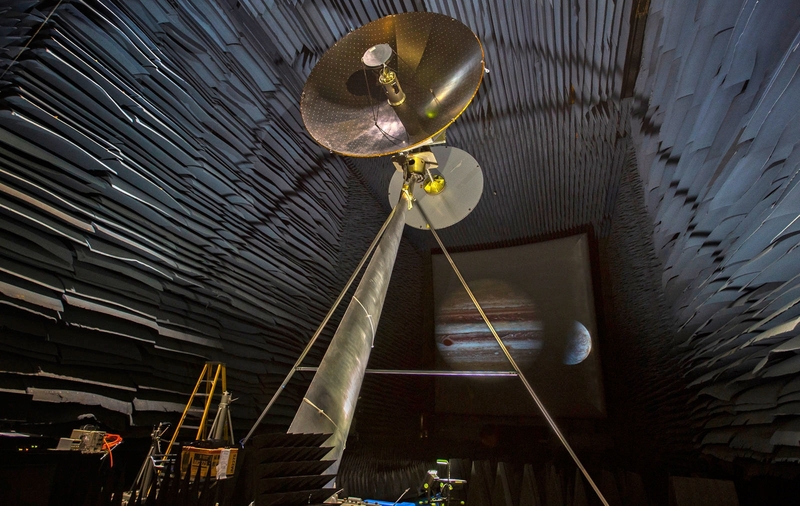 In order to beam back information from that far into the solar system, the Clipper will be equipped with a high-gain antenna (HGA) that the space agency is currently testing. NASA is evaluating a full-scale 10-foot-tall prototype of the HGA — a directional antenna that allows precise targeting of radio signals — at the Experimental Test Range (ETR) at NASA’s Langley Research Center. The Clipper team is assessing its performance in the electromagnetic test facility’s controlled environment, much like how the Mars helicopter team used JPL’s Space Simulator to prove their unmanned flying vehicle works. In particular, they’re making sure it’s highly accurate when it comes to pointing to its targets, since that’s the key to sending back high-resolution images and huge volumes of scientific data. “The measurements that will be performed in the ETR will demonstrate that the Europa Clipper mission can get a large volume of scientific data back to Earth and ultimately determine the habitability of Europa,” said Thomas Magner, Europa Clipper’s assistant project manager. Scientists believe the moon’s thick, icy crust is hiding a global salty ocean. A NASA official once said that it’s one of the “most promising places that could potentially harbor life in the solar system” outside of our own planet and is definitely worth a visit. While the Clipper team is almost done with its current round of tests, they’re planning to conduct more in the same facility before the spacecraft blasts off. The Europa Clipper is expected to launch sometime in 2020 and will take three to seven years to reach the gas giant, depending on its launch vehicle and other factors.